This has been a freaky week for your favorite Poetry & Popular Culture blog, which accidentally helped to create what one reader called a "media frenzy" around J.T. Dutton's forthcoming novel "Freaked." I highlighted Dutton's book on August 9 because the novel—like many other novels in 20th century American literature—incorporates poetry, including Grateful Dead song lyrics, on a number of levels. For Dutton, this incorporation was made, um, more difficult than she expected because the copyright owner for the Dead songs (Ice 9) wouldn't allow Dutton to quote as extensively as she wanted to do. University of Iowa Communications Professor Kembrew McLeod—a specialist in the politics of copyright and proud owner of the trademark for "Freedom of Expression"—sent an excerpt from my post on Dutton's book to Boing Boing, which ran it under the somewhat sensational headline, "Grateful Dead lyrics cannot be quoted in children's book." That posting quickly created a furor. From fans claiming Ice 9 was betraying the Dead's legacy by restricting use of the band's lyrics, to folks advocating for copyright protection of artists' work, people responded passionately to the behind-the-scenes copyright issues of Dutton's book. You can see that discussion here: http://www.boingboing.net/2008/08/12/grateful-dead-lyrics.html. "Poetry & Popular Culture" registered this energy as well, with a massive spike in site traffic: thanks to McLeod and Boing Boing, there were 676 visits to "Poetry & Popular Culture" on August 14, up from 30 the day before; there were 665 views of the post on Dutton's book; 84% of visitors were new to the site. I am the author of Freaked and here is my perspective on this story. I had no legal battles or even conflict with Ice 9. I contacted them for permissions and they offered me some, but not all of what I wanted. Usually money changes hands when writers ask for permissions. In my case, Ice 9 gave me the use of what lyrics I did use for free. Their hesitation about giving the full amount had to do with the feeling that allowing me to use too much would seem to be an endorsement of my work. Getting their endorsement would be huge--as one commenter put it, a money vein. Of course they have to be careful about what they lend. I wrote about the Dead because I happen to love their music, and using their lyrics was part of telling this story. For a while, Dutton's posting put a stop to the argument on Boing Boing. Without the saga of a legal battle to propel the matter, and with Dutton's report of her compromise with Ice 9, people backed off and the discussion stalled. What I see as a central issue with "Freaked" went no further: no matter how amicable the compromise with Ice 9, the legalities of copyright—and the economic power Ice 9 leveraged to grant or refuse permission—forced Dutton to change the book and compomise her original vision. The book that your bookstore will carry is not the book Dutton entirely wanted; in the end, for better or worse, economics trumped the art. I'm bringing this up now because the passion unleashed by Boing Boing's headline—a passion which demonstrates the proprietary interests that consumers, music listeners, and readers have in the texts they hear and support—has its roots in the popular culture of poetry in the 19th and early 20th centuries. We're familiar with the fan's sense of ownership over, and participation in, the rock and roll song and its success—see your mix tapes, your fan zines, the Boing Boing commenters who claim to carry on the Dead's communitarian spirit in an era when their works are copyright protected, etc. But this passion, and this way of engaging with texts (be they read or heard) is not unique to rock and roll culture. We only have to look at a book like Meredith McGill's "American Literature and the Culture of Reprinting, 1834-1853" (University of Pennsylvania Press, 2003) to realize that the controversy stretches back nearly 200 years. In this book, McGill reports on the formation of copyright law in the early nineteenth century U.S. and how many Americans perceived copyrighting to be downright anti-American—more a legacy of British aristocratic culture than an expression of America's democracy and equal availability and ownership of texts once they were made public, purchased, and owned. This was (and is, if the controversy over the Dead lyrics is any indication) especially the case with poetry, which was short, easily excerpted and reprinted, easily clipped and saved in poetry scrapbooks, easily slipped into and out of what Joseph Harrington calls new and different "presentation contexts." 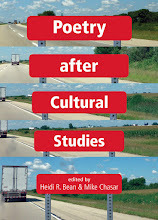 (See his book "Poetry and the Public: The Social Form of Modern U.S. Poetics" [Wesleyan UP, 2002].) Poems by Longfellow and Poe were reprinted word for word with impunity in this pre-royalties age, and not just on brochures for noble civic and educational events, but in advertisements as well. When American readers clipped poems from newspapers and magazines for their scrapbooks, they regularly cut off the author's name and bibliographical information; for many individuals, those things meant far less than they do now. (In fact, I wouldn't be surprised to learn that a byline is positioned underneath the title or headline today—rather than being printed at the end of a poem or article—because it makes cutting the author's name off much more difficult than if it appeared at the end). 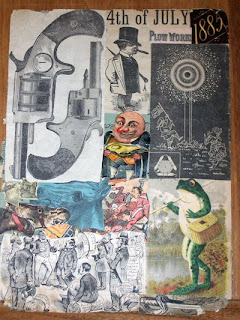 As the 19th century scrapbook art in the image to the left illustrates, this is the age in which the collage ethic of popular culture was born. Considering the drastic changes that the U.S.S. Lynx has made to the poem, it's a wonder that the ship nevertheless felt moved to print Longfellow's name as author at the same time. While, yes, Longfellow did write the words that appear on the menu, there really isn't any way to say he authored the actual poem that the Lynx has come up with for its Christmas meal. 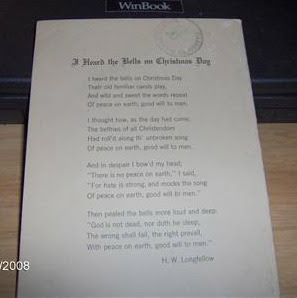 I realize I've come a long way from the stir that Dutton's book elicited on Boing Boing, but the history of "I Heard the Bells" provides an interesting point of comparison: an artifact from a day when copyright ownership worked differently than it does today, and from a time when readers—at home with their scrapbooks or at sea on Christmas day—felt just as licensed to cut up, recirculate, or otherwise own poetry and song lyrics as they do now. Only nobody got as freaked out about it as they do today.